We never know how many people we’re going to have. Last year it was 30+ (in this same room). This year, I think we’ll have 14-15. That should be more manageable, right? I have two nice (not pretty but, nice and sturdy) tables and am slowly dragging in my mismatched chairs and benches. I’m not feeling the charm. Half of what you see is for a kitchen estimate in the morning. That will be gone. I’ll pretty it up. But . . . this is where I usually work on furniture (notice the stack of trunks in the corner and the random assortment of dressers?) and it is what it is. This is the current state of my living room. Notice the empty, un-Pinterest-worthy mantle? I had ambitions sometime last week. Not happening. I don’t want to move the furniture until I figure out where a Christmas tree can fit so we don’t have to move everything again in less than a month. So, we’re just going to go with it. It always works out. We always have fun. 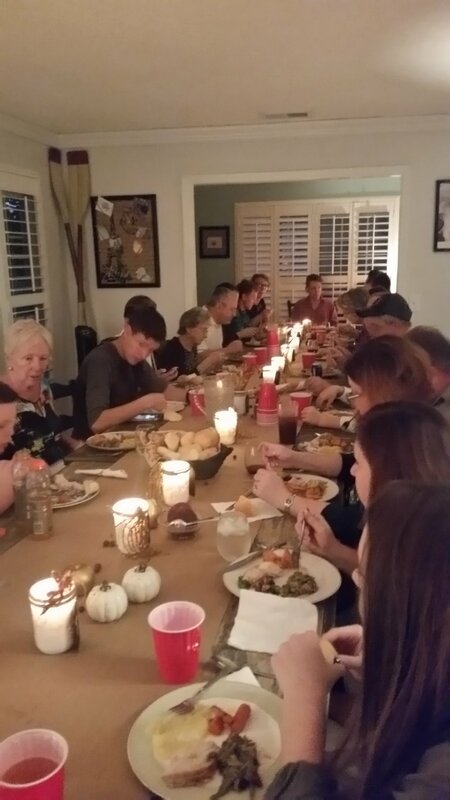 Everyone fits at the table no matter how many there are. Sure, I’ll clean things up and move the furniture. But, it’ll just be imperfect us and our perfectly imperfect guests. And, it’s going to be awesome!